Any one who has ever had even limited contact with our beloved Samoyed breed can attest that they are something special. They are jokesters, happy, intelligent and, yes, “drop dead gorgeous dogs” with bright smiling faces. Yet, as we all know, under all that thick white hair lives the heart of a true “working dog.” They were originally bred for multiple tasks by the Samoyede people to work at jobs that included reindeer herding, sledge pulling to family companion. 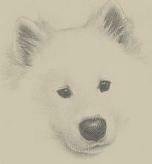 Today’s Samoyed is in essence no different from their ancestors. Many of us know that our Sammies love to “work” mostly at playing, having a “good time,” or getting in to mischief, yet a well trained Samoyed can participate AND enjoy a wide variety of “serious” working activities with their human families. High among the list of these activities are: Obedience, Weight-Pull, Agility, Herding, Backpacking, Flyball, Canine Good Citizen and Therapy Dog. Some of these activities are “just for fun” but some can lead to titles and those very impressive letters after your Sammies name. Frankly, these activities are more than just a fun time; they are also an opportunity for Samoyed and owner to form a special lasting bond. There are several groups that offer titles. CGC or Canine Good Citizen can be attained by passing a relatively (for Sammies anyway) test sponsored by the AKC. Titles for Herding and Obedience can be obtained at many AKC (American Kennel Club) events as well as more local group sponsored events. Weight-Pull groups like the IWPA (International Weight Pull Association) and Agility groups like the USDAA (United States Dog Agility Association) offer places to compete with other breeds for titles. The AKC also offers titles for Samoyeds in Agility, Herding, Obedience and Tracking Tests. The “working dog” titles for Samoyeds are offered by the SCA (Samoyed Club of America) or the OWS (Organization for the Working Samoyed). These titles are “won” on a point system for each event and or placement in an event. Once a certain number of points are reached that wonderful WD can be added to your Samoyed’s name and worn proudly by dog and human. You may think that these titles are just for “show” Samoyeds or intact AKC registered dogs. Only in part is that true. First, a spayed or neutered Samoyed with an AKC number can compete for these titles. More important to those of us who own Rescue Samoyeds without AKC registration numbers on our dogs; these titles are available to us also. The AKC has an Indefinite Listing Privilege (called the ILP number) for any breed or dog that applies and qualifies. With this number your Samoyed can compete in the above mentioned AKC sanctioned “Companion and Performance Events.” The process is relatively quick and painless. The process takes about two weeks and you are ready to compete. If you have any questions or need any help with the process I talked with Kristin at AKC Registration, a very nice lady, who assured me that if you call her direct at 919-816-3673 she will be more than happy to answer questions and speed the process along. In 2001 AKC granted over 2000 ILP numbers and awarded over 2000 AKC Titles to ILP dogs. With the AKC ILP number you are now ready to compete for points toward titles at an entire gambit of events which also includes regional Samoyed Specialties and, of course, the Samoyed Club of America National Specialty in the Fall of each year. An added benefit of obtaining an ILP number for your rescue Samoyed is you are now eligible to apply for membership in the Samoyed Club of America to not only be a part of the 1100+ Samoyed fanciers/lovers but to allow your voice to be heard in issues that affect all Samoyeds. You may go to your local kennel clubs, humane societies or local Samoyed clubs for information on obedience training and events, flyball groups, local MUSHER groups for dog sledding training and competition. The information provided in this article is provided in hopes that you and your Samoyed will have a long and splendid relationship.